What is Holography? | Take The RedPill! A hologram is a physical structure that diffracts light into an image. The term ‘hologram’ can refer to both the encoded material and the resulting image. 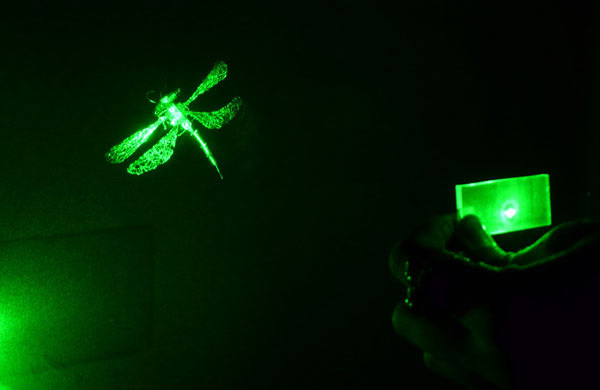 A holographic image can be seen by looking into an illuminated holographic print or by shining a laser through a hologram and projecting the image onto a screen. Other methods of projecting and reflecting images are often described as holographic – or even misleadingly holograms, because they have an optical presence and spatial quality. For example the Pepper’s ghost technique, which uses a partially reflective surface to mix a reflection with the scene beyond. John Henry Pepper demonstrated the technique in the 1860s with it being used to overlay visual elements (often a figure – ‘ghost’) onto a physical set or stage. Holography is based on the principle of interference. A hologram captures the interference pattern between two or more beams of coherent light (i.e. laser light). One beam is shone directly on the recording medium and acts as a reference to the light scattered from the illuminated scene. The hologram captures light as it interests the whole area of the film, hence being described as a ‘window with memory’. By contrast a photograph captures a single small area ‘aperture’ of perspective, the photographic image being created by focusing this light onto film or a digital sensor. The physical medium of holographic film is photo-sensitive with a fine grain structure1. Common materials used are silver-halide emulsions, dichromate gelatins and photopolymers – each having their own characteristics and require different processing. Holograms can also be embossed ‘stamped into a foil’ with applications including in security identification, such as on passports, credit cards, tickets and packaging, as they are difficult to copy without the master hologram. The hologram is the recorded interference pattern of constructive (intensity peaks) and destructive (elimination) of the superimposed light-wavefronts (the electromagnetic field). By using a coherent laser light-source and a stable geometry (or short ‘pulse’ duration) the interference pattern is stationary and can be recorded into the hologram’s photosensitive emulsion. The hologram is then chemically processed2 so that the emulsion has a modulated density, freezing the interference pattern into ‘fringes’. When looking at the modulated structure under a microscope it does not look like the image encoded within. The density fringes are a distributed pattern of wavefront interference – a frozen distributed recording of the direction, phase and amplitude of light (the visible spectrum of electron-magnetic radiation). When the hologram is re-illuminated the light is diffracted through these fringes. If the direction and shape (curvature) of the light is the same as the reference beam then the hologram diffracts the light into the shape of the other wavefront, reconstructing the recorded image. The relationships that can be set up with the holographic image suggest a particular way of considering optical information. While there are a number of ways of making holograms, each having their own aesthetic qualities they all have the same underlying principle. Holography is a way of encoding recording an interference pattern. On encountering a hologram, what is most surprising is that a surface seems to hold a space. The difference of scale between the optical shaping by the hologram structure and our material sense of it as a surface produces a perception of a virtual form, as if the light holds its own shape. Viewing a hologram print, the image changes as you move around. As if you were looking through a window onto a scene. This is because holography records the scene through an area of perspective. The viewing window of a hologram can also be broken up to record many different perspectives, this process is know as spatial multiplexing, and can be used to capture animation and/or create a holographic scene from a sequence of 2-d images. The two basic geometries for holograms are – transmission – where light is shone through the hologram, and – reflection – in which the hologram reflects light. The recording of transmission and reflection holograms were developed from two different fields of enquiry and have distinct optical aesthetics. The reflection hologram was developed by Yuri Denisyuk3 (1927–2006) who used a single beam to both illuminate the object and be the reference. Denisyuk’s process follows the colour and spatial photographic recording practices of Lippmann photography and Daguerreotypes, which were created on polished metal surfaces. Gabriel Lippmann (1845–1921) claimed to have invented a method of colour photographic recording and provided a scientific explanation of how the emulsion structure recorded and then could reconstruct optical standing waves patterns, the particular wavelengths of which comprise a colour image. While Lippmann was the first to explain this process, later analysis has shown that his method of recording was similar to the Daguerreotype4. In both a Daguerreotype/Lippmann recording and the reflection hologram, the colour of the image is selective, only being formed by the wavelengths that resonate with the spacing of the fringes. By using multiple colour lasers a full colour Denisyuk reflection hologram can be recorded and is almost indistinguishable from the original object. The tendency on encountering such an image is to check its authenticity – to look behind the plate for the object. The process of transmission holography developed from a series of scientific experiments and a developing understanding of the wave-nature of electro-magnetic radiation. In 1912 by Max von Laue demonstrated the diffraction of x-rays through a crystal lattice of copper sulphate. Experimental results were then formulated in 1913 by father and son, William Henry Bragg and William Lawrence Bragg, into Bragg’s law of diffraction (2dsin ? = n? ), which equates the fringe spacing (d) to the angle of deflection (?) for any given wavelength (?)5. Using this relationship diffraction gratings can be made to control the angle of deflected light and separate different wavelengths of light. The key step in the development of holographic imaging was the use of a reference beam to encode one wave by superimposing it with another (to record the interference pattern). This ‘double diffraction’ process was proposed by Denis Gabor in 1948 in an attempt to improve the design of the x-ray (electron) microscope. Gabor’s experiments were limited to optical-waves traveling close to the optical axis (paraxial rays) and hence when used for optical holography the reconstruction beam was co-incident with the image, and thus would shine directly into the viewer’s eyes. Emmett Leith and Juris Upatnieks while working with side-reading radar developed the technique of off-axis optical holography in 1962. Their theory proved practically possible when they gained access to a laser in 1964 and produced a number of holograms. The potential of holography was recognised the moment these holograms were published, causing a flurry of research and Gabor’s awarding of the Noble Prize for Physics. As transmission holograms diffract all of the illumination into the image, ‘mono-chromatic’ light (such as from a laser) is needed to reconstruct a sharp image. Stephen Benton developed transfer geometries that allowed transmission holographic prints to be viewed with a white light source; including the rainbow hologram in 1969 and using an achromatic geometry in 1977 to recombine the spectrum. There are a number of distinct types of display holograms that can be defined by their optical-geometry and the recording medium. The laser viewable transmission hologram allows for a near perfect reconstruction of the optical field. This means that the recorded scene appears behind the film, and when replayed by a laser this scene can be very deep and sharp. These holograms are also used as a master recording that can then be transferred into a reflection or transmission holographic print. Artist Paula Dawson who has worked extensively with laser viewable transmission holograms describes these recordings as ‘concrete’ holographic images because they create a sense of physical presence. The holograms hologram diffracts the light into an image. As described in the previous section ‘The development of holography’ transmission and reflection holograms differ because of the fringe structure. The reflection hologram reconstructs only selected wavelengths (colours) while the transmission hologram diffracts all the wavelengths of light that is illuminated with. The hologram does not change the wavelength (colour) of light but controls where different wavelengths are diffracted. Multiple colour of a holographic images are then produced by selecting and combining the diffracted spectral colours. With a reflection hologram by manipulating the chemical processing, the holographic fringe structure can be expanded or shrunk changing the colour of the reconstructed image. Pseudo-colour reflection holograms can be created through multiple exposures between which the emulsion is swollen or shrunk to shift the recorded fringe spacing and therefore colour, a technique that has been used extensively by John Kaufman and Iñaki Beguiristain. Transmission holograms however have a different a visual quality and the colour is controlled by geometry rather than chemistry. When illuminated with a white (broad spectrum) light source the transmission hologram will diffract all the wavelengths of light into the image. However as red-wavelengths are longer, they are deflected more than blue-wavelengths and so the image will have some colour smear – the multi-spectrum light spreads into a rainbow image. A rainbow hologram, recorded from a horizontal master strip and replayed with a light from above, will have horizontal parallax – enabling the spatial qualities when looking with two eyes or moving side-to-side. But moving up-and-down produces no change in spatial perspective and viewer only sees a change of colour. By recording a number of masters on an achromatic angle the spectral colours can be recombine to produce images that are whitish (achromatic) or colour-mixed (ie, RGB red+green+blue). Recording a hologram requires the interference pattern of the reference beam and scene illumination to be stationary during the exposure. For this reason holograms are traditionally made of static sculptures on vibration isolated tables. A pulse laser produces an ultra short flash of light, thus freezing motion and allowing for holograms of live subjects. As the holographic recording process is dependant on the interference pattern between optical-waves the holographic image is the comparative shape between these waves. Holographic interferometry utilizes this property to detected small variations in form, with applications in industrial non-destructive testing. As part of her ‘Strata Series’ Sally Weber used a holographic interferometry technique – a double laser pulse – to show the movements of breath and blood under the skin. Multiplexing is a technique of recording multiple holographic exposures across the surface of the master hologram. By transferring a multiplexed master, a final print can be produced where the ‘virtual windows’ onto the scene is fragmented allowing for spatial animation, stereopsis and depth perception by parallax as the viewer moves around. Lloyd Cross developed a one step process of recording multiplex holograms in 1972, using a sequence of film frames to make a cylindrical hologram where the image appears in the centre. The process combines cinematographic and holographic techniques to display a short animated image loop. By either rotating the cylinder or if the veiwer walks around they see the image animated. By dividing the holographic window into small exposure regions, multiple 2-d images can be used to synthesize a 3D scene or record an animation. With computer generated ‘digital’ holograms the fringe pattern of each pixel is calculated and recorded into the hologram. There are a number of ways of making digital holograms in which small regions of the film, termed ‘Voxels’ or ‘Hogels’, are exposed to the pre-calculated fringe pattern, such as by using a spatial light modulator (SLM) or electron beam lithography. In early systems these Hogels were noticeable causing the surface of the hologram to look pixilated. Holography allows for the recording and reconstruction of spatially-dependent images. The holographic image is based on optical-material interference rather than sensors and programs; the information is enfolded within the surface rather than being applied onto it. We sense the difference by moving around, and returning to find the image again. The holographic image has its own presence, which we move through, playing the image with our own perception and agency. The relationships that can be set up with the holographic image suggest a particular way of considering optical information. While there are a number of ways of making holograms, each having their own aesthetic qualities they all share the same underlying principles of holographic imaging. Holography uses an interference pattern to encode and record an image. The reconstruction of this image is an optical ‘shaping’ that appears distinct from the material surface. We perceive the light that flows through the hologram as holding space. This perceived space is dependent on the perspective from where it is viewed, allowing for a hologram to render a spatial and dynamic scene. Barger and White (1999) The Daguerreotype: Nineteenth Century Technology and Modern Science, JHU Press. Gabor (1948) ‘A new microscopic principle’, Nature, 161, p 777 – 778. Kafri and Glatt (1990) The physics of moiré metrology, Wiley. Syms (1990) Practical volume holography, Clarendon Press.